Chicken with sweet potatoes and mushroom stuffing make for a fulfilling campfire meal. In my mid-20s, I moved to Healdsburg, Calif., hardly knowing anyone and without much of a plan. Since Healdsburg sits at the point where three of Sonoma’s major wine regions meet, I thought I would try to get into the wine business. At the time, I knew next to nothing about cooking and probably wouldn’t have known how to peel a garlic clove if you handed one to me. However, so close to the birthplace influential California cuisine, the appreciation of good food and cooking is a way of life there. I ended up working in a bakery owned by two alumni of Chez Panisse and was fortunate to be introduced to a group of friends who cooked together often. I experienced the power of coming together around food, creating deeper connections and an improvement in our overall well-being. It made me fall madly in love with cooking, which forever changed the course of my life. After attending culinary school in Portland, Ore., I came back home to Washington, DC, where I met my wife, Miranda. One of the first things we bonded over was our shared love of nature. We have a tradition of visiting a new national park every year, and we try to get out of the city for weekend “adventures” in the Shenandoah Valley at least every couple of months. In the winter, we opt for the cozy cabins at Getaway in Stanardsville, Va. It’s set up like a campground, but you get to stay in the coolest tiny house that you won’t ever want to leave—think Scandinavian minimalism meets rustic log cabin. The comfy queen-size beds are next to a large window looking out into the woods. Each cabin comes with its own fire pit and everything you need for a campfire, including firewood. Inside there is a small kitchen with a couple of burners, a sink and a mini-fridge. I wanted to bring my new friends in DC together around a meal like I had experienced in California. And what better way to do so than to host a feast by campfire? People have been gathering around fires since the beginning of time. So we invited a few friends along with us to Getaway for campfire feast. I came up with a seasonal menu that would work for any holiday dinner, while taking flavor inspiration from the aromatic, earthy woods our region is known for. The dishes all have lots of woody herbs and I found a way to include local wild mushrooms. Rainbow carrots and sweet potatoes add a splash of color to this roast chicken. Since the campfire can be fickle, I didn’t want to risk everyone having to wait up all night for a turkey to cook. So, I opted for a Dutch-oven roast chicken, with sweet potatoes, carrots and fennel to be served on the side. Inside the chicken was a wild mushroom duxelles stuffing to complete three dishes in one pot. 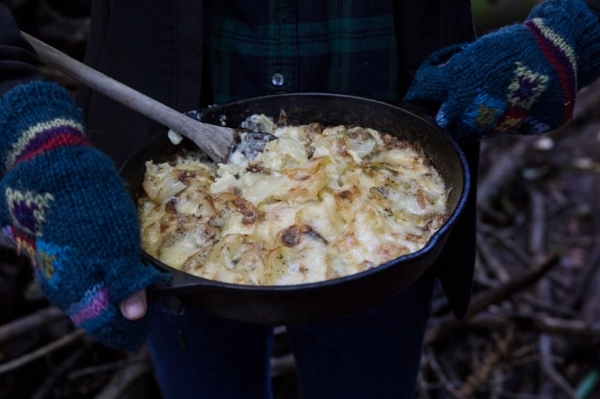 Alongside the Dutch-oven chicken, potatoes au gratin with rosemary cooked in a cast-iron pan with a lid. I also prepared a simple salad of winter greens and garlic chives with an herbed lemon vinaigrette to balance out all the heavy food. To drink around the fire, I had a hot apple cider with cinnamon and some apple mint that I found at the farmers market the day before. Adults could add their own splash of bourbon to the cider, so our friends’ children could enjoy it too. And, the next morning, cinnamon rolls were cooked in cast iron over the fire, then topped with cream cheese frosting. I love cooking over a campfire because, just like camping, it allows you to unplug. In this case, from the controlled environment of the kitchen. Without temperature dials and timers, you have permission to let go of perfectionism and rely on your intuition and senses. Sure, your food may not come out precisely evenly cooked. You might burn something or have to throw an undercooked piece of meat back on the fire. But I guarantee everyone will happily eat what you serve. There is something deeply satisfying about coming together around a campfire to enjoy a good meal. A maple marinade helps this roast chicken achieve fantastic flavor and color. This Dutch-Oven Roast Chicken can be a full meal in a one pot. The maple syrup marinade drips down into the sweet potatoes and carrots, gently enhancing their natural sweetness, and the juices from the chicken are absorbed by the vegetables making them moist and savory. 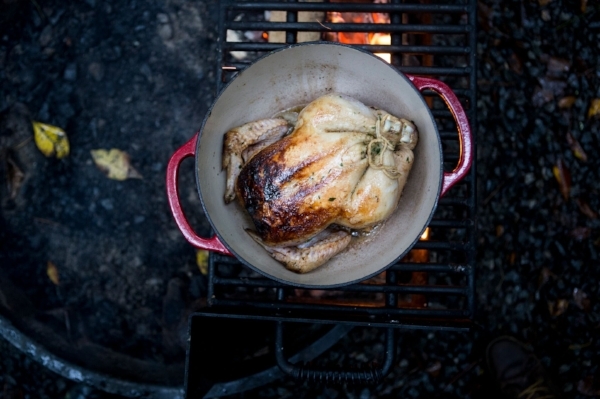 It’s really an easy dish to pull off on a campfire with the right equipment (a cast-iron Dutch oven with a lid, charcoal and a shovel for placing the coals). When I do this dish for a campfire, I marinate the chicken the day before we leave. Then I transport it in a cooler, wrapped tightly in plastic wrap and sealed in a zip-top bag. If you opt to do the wild mushroom duxelle stuffing, you practically have a entire fantastic meal in one Dutch oven. Whisk together all the ingredients for the marinade in a small bowl. Pat dry the chicken and brush it all over with the marinade, pouring any remaining marinade over it. Seal the chicken in a plastic bag or tightly lidded container and marinate in the refrigerator for up to 24 hours. About an hour before cooking, remove the chicken from the refrigerator and its container and pat dry. Set it on a plate and allow to come to room temperature. When ready to cook, completely pat dry the chicken once more and stuff the cavity with the Wild Mushroom Duxulles Stuffing (if you are making it). 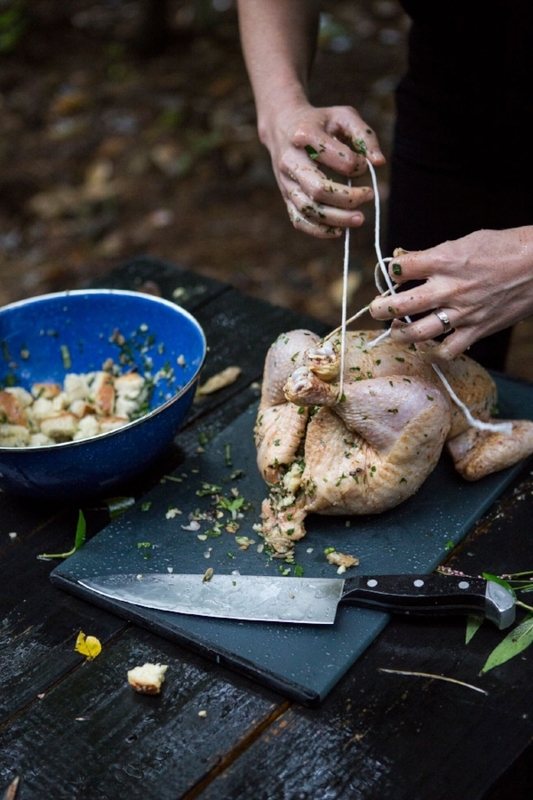 Tie the legs together with kitchen twine to seal in the stuffing. If cooking this at home, preheat oven to 450°F. Heat an 8- or 12-inch Dutch oven until very hot but not smoking (if cooking on the campfire, you’ll want to put about 11 hot coals under the Dutch oven). Add the 2 tablespoons olive oil and 2 tablespoons butter. When the oil has heated and the butter has melted, place the chicken in breast side down. Sear until the breast is golden brown, about 4 to 6 minutes. Carefully flip the chicken over. Put the lid on the Dutch oven and roast at 450°F for 30 minutes (for cooking on the campfire, spread about 20 coals on top of the lid of the Dutch oven). Meanwhile, toss the sweet potatoes, fennel, carrots and onions with olive oil, salt and the lemon zest in a large bowl. Mix well to make sure all the veggies are coated in the oil and seasonings. After 30 minutes, remove the lid from the Dutch oven and arrange the vegetables around the chicken. Place around the thyme and rosemary sprigs. Replace the lid (and place the coals back on top for campfire cooking). Cook for about another 30 minutes, until the chicken reaches an internal temperature of 165°F and all the vegetables are cooked through. Let the chicken rest for at least 15 minutes before carving. Wild mushrooms add flavor and depth to a traditional sage-centric stuffing. This stuffing borrows from the classic French savory pastry filling duxelles, which is typically a cooked mixture of mushrooms, shallots and herbs. The wild mushrooms make it absolutely delicious, and the sage brings in a familiar taste most of us are used to in stuffing. I recommend cooking it inside the chicken because the flavor from the roasting juices moistening it are unparalleled. Heat a large sauté pan over medium-high heat and add the olive oil. When the olive oil heats up, add the mushrooms and stir to spread throughout the pan. When the mushrooms begin to brown, add the shallots and garlic. Season with a pinch of salt and stir; cook until the mushrooms are completely browned and the shallots and garlic have softened. Scrape the mushroom mixture into a medium bowl. Add the bread, parsley and sage and mix to combine. Stuff the cavity of the chicken with the stuffing. Alternatively, add the bread, parsley and sage into the pan with the mushroom mixture and moisten with about ½–1 cup chicken stock. Cook until hot. Lemon and rosemary brighten this classic French gratin. I had to include this potatoes au gratin recipe because it is my wife, Miranda’s, favorite. It has the flavor of a classic French gratin with butter, cream and gruyere cheese. The addition of lemon zest brings a little brightness to it, and the rosemary gives it an earthy aroma reminiscent of a walk in the woods. If making this at home, pre-heat oven to 425°F. Thoroughly butter an 8-inch cast-iron pan and run the cut sides of the garlic clove all around the pan to impart a garlic flavor. Arrange the potato slices in the pan, season with salt and sprinkle the rosemary and lemon zest all around. Once it begins to brown on top, remove from the oven and top with the gruyere cheese. Return to the oven and cook for about 10 minutes more until the cheese melts and browns. (For cooking it on a campfire, carefully remove the lid and sprinkle on the gruyere cheese. Replace the lid and cook for about another 10 minutes, until the cheese melts. Be sure to check out a campfire cinnamon roll recipe here.